Think of it like a electronic journal that you put in text, photos and video. You tag places you are and the people you are with. Then, think of it as a place that is private to you and up to 50 friends. Not thousands of unknown viewers or short time relations. This is a place that you share with folks you can feel comfortable sharing with. Removing the worry of a photo you snapped showing up being reposted by someone you don’t know or in an ad for a service you know nothing about. This place is Path, and the place lives on your iPad and iPhone through their free app. The app isn’t universal, so for now, you have to run it in 2x mode on the iPad. From within the app, you build Paths that you share with friends and family. You can have different Paths, maybe around shared trips or events. Then, folks you have requested to be part of that limited 50 and able to view that Path, can also share their text, photos and videos. The first reaction of most folks is this is a highly limited social system. Actually, imagine how you would share differently if you where talking to someone in the car with you or enjoying a movie together. Think of how a parent that travels a lot can share with a child moments in both of their lives. There is nothing that says you can’t create a Path for coworkers too. The app is open with only the quantity of viewers you can allow limited. 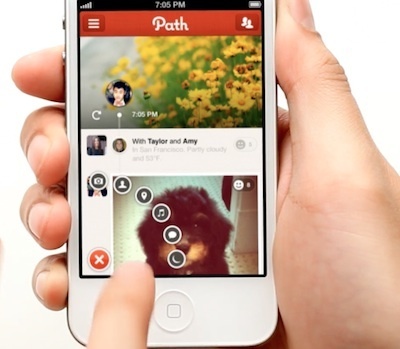 The makers of Path have stated that the limitation is their planned path forward so this won’t become a Twitter stream, a Google+ mega circle or Facebook friends frenzy. The way to truly understand how limiting your viewers can adjust your thinking is to give Path a try. Using it, forces a person to rethink how they view their sharing groups. And, what motivates a post or what was limiting you from posting something on another social system. Additional features in the latest Path 2.0 is the ability to customize the cover of a path. As well, you can have a path that accepts information like your daily Jawbone Up workouts and sleep feed. New Design — We’ve re-imagined what Path is with a brand new design and new stories. Covers — Decorate your Path with a large beautiful photo, like wallpaper for your Path. Automatic — A journal that writes itself, Path can recognize when you spend time in a new neighborhood or visit a new city and records it for you automatically. Music — Share and enjoy what you’re listening to with your Path friends. Sleep — Record your sleep schedule to your Path with correct moon phases and number of hours slept. 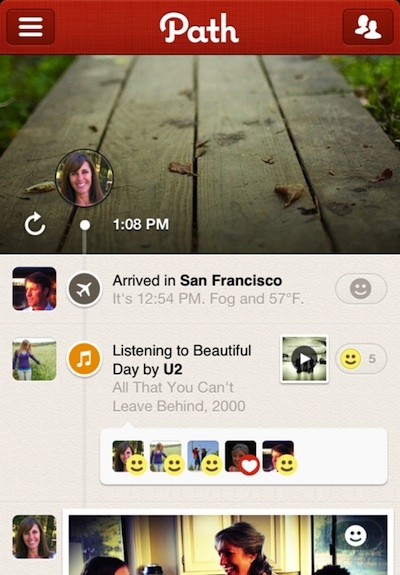 Check-in — Let your friends know where you are by sharing places on Path. And if you like, check-in on Foursquare too! Private — Keep any post to yourself with a simple private option, or just share with your friends on Path. Notifications — Receive better push notifications directly to your iPhone or iPod touch. Settings — Customize your email and notification preferences from within Path.